Hit fastballs, inside breaking balls and outside breaking balls right in your own backyard with the Slider Lite-Ball Pitching Machine and the PowerAlley Batting Cage. 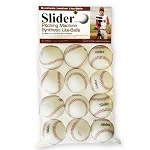 The Slider Pitching Machine includes an automatic ball feeder which holds 12 lite-balls so you can practice whenever you want, without needing another person. Once the automatic feeder is on, balls are pitched every 9 seconds. 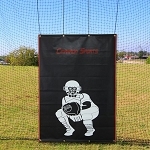 The Slider Lite-Ball Pitching Machine also can be swivel adjusted to throw curve balls and fastballs up to 60 miles per hour. Along with the pivot head design and adjustable pitch height, you can custom design your pitches to match your opponents. 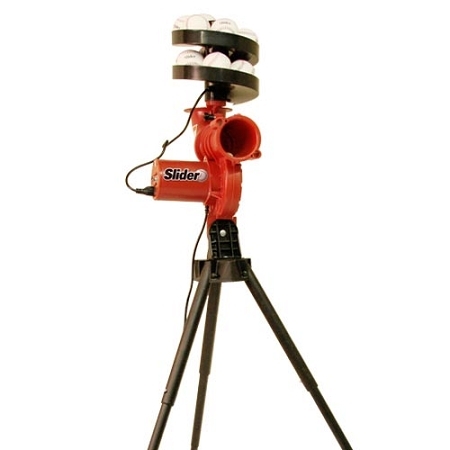 The quality design of the Slider Lite-Ball Pitching Machine makes it durable and adaptable. This pitching machine's legs are built of tubular steel and are made to last. 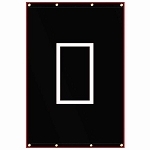 It can plug into an outlet using the included A/C adapter for long term practice. A fully enclosed wheel means maximum safety for you and those around you. You can also significantly increase your hitting time, and your batting average, by reducing the amount of time you spend gathering balls and practicing on your own whenever you want by adding the PowerAlley Batting Cage along with the Slider Pitching Machine. Instead of spending most of your time hunting for baseballs, you can spend more time hitting because all hit balls are contained within the net, allowing quick and easy refills. Not only do you save time during actual practice, you also do not have to spend time looking for a place to hit. You can practice right in your own backyard knowing every hit ball is within close proximity. Due to these two time-saving factors, studies show that by using the PowerAlley Batting Cage you can hit over 5 times as many pitching machine pitches than without it in the same amount of time. Due to its quality and durability, the PowerAlley Batting Cage is made to withstand the elements. It boasts a fiberglass pole frame, which sets up with ease. Thick 1 inch polyethylene netting keeps any hard hit ball from escaping and sturdy ground stakes insure the structure will stay in place. This batting cage provides plenty of room for hitting, measuring 22 feet long, 12 feet wide and 8 feet high. It comes with a built in harness to support the Slider Pitching Machine. Like all Heater Sports products, the Slider Pitching Machine and the PowerAlley Batting Cage is backed by a 1 year warranty and a 30 day money-back guarantee so you know your purchase is secure. 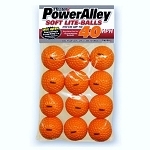 Bought this for my 10 year old along with the orange balls as recommended for his age and the speed of the desired pitch. Balls are terribly inconsistent and most of them don't even make it to the plate. Net was pretty simple to assemble and has been easy to lay down when storms have come through. Bought in August and have yet to use machine it for a full BP 2 months later. Contacted Heater and they have a new machine on the way. Manufacturer and seller were excellent to deal with and customer service on both ends was great. Frustrated child however as birthday gift seems like a pretty big flop so far...disappointed parent as for the $ I would have accepted a slower machine but expected it to work nonetheless. Q: Can we use this one for girls softball as well? A: This pitching machine only throws baseball sized light balls, but sure, you could use it to practice hitting for softball. If you can hit a smaller baseball, a softball will seem huge and much easier to hit! To ensure your satisfaction, the Heater Slider Pitching Machine and PowerAlley batting cage includes a 30 Day Money Back Guarantee. Both your pitching machine and batting cage are also backed by a Full 1 Year Warranty that includes repair, replacement and labor. No matter where you order a Heater Slider Lite Ball Pitching Machine & PowerAlley batting cage package from, NOBODY actually stocks them; they all ship directly from the manufacturer's warehouse located in St. George, Utah. Therefore, the shipping time frame is exactly the same no matter what website you order from (we hope that it is this one!). Heater Slider & PowerAlley Cage combo packages typically take 2-4 business days to ship from the time you place your order. They ship via Federal Express (FedEx) Ground and could take anywhere from a day or two to a week to get to you AFTER being shipped, depending on your proximity to their warehouse. We will notify you of your tracking number the moment we receive it from the manufacturer's warehouse.